A new accounts payable employee receives an spoofed email from the company president. Send a $20K direct deposit to this bank account… do it right away! Spoofed emails are so realistic and well timed that they really seem genuine. They include real names and an Internet domain that is almost correct. For example, the accounts payable clerk gets an email from George, the company president. George’s real email address is geo@StartupInc.com. The spoofed email comes from geo@Startup1nc.com … Can you spot the alteration? 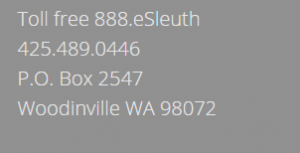 Public records listing George’s real email address make a look-alike easy to construct. Just add an “s”, switch “1” or “l” for “i” or change the location of a couple vowels. The fraudster buys the Internet domain startup1nc.com. Mail service for the new domain is set up. A bit more research gives the email address for the victim: ap@StartupInc.com and possibly some schedule information about the president being out of town next week. The fraudster opens a new bank account that will hold the direct deposit for a day before shipping money overseas. Our investigation of these sort of cases often follows a path to define whether the attacker is an insider or not. It also can identify other victims; this is important for getting the attention of law enforcement. All of these steps can be accomplished quickly and will fuel the analysis necessary to figure out what is happening. Moving fast is critical for money recovery, law enforcement effectiveness and corporate sanity. This sort of crime can be prevented with good financial procedures and employee education. Our investigations are helpful in the recovery process. The cost may be covered by insurance. We enjoy working on cases of this sort… we are the eSleuths.